The House Call Vet service all areas of Brisbane with no travel charges – Ever! Our standard consultation fee is just $72.50, no matter which area of Brisbane you live in. CBD, West End, New Farm, Indooroopilly, Kenmore, Moggill, Mt Crosby, Jindalee, Inala, Camira, Moorooka, Sunnybank Hills, Rochedale, Mt Gravatt, Carindale, Hamilton, Paddington, Ashgrove, Keperra, Stafford Heights, Chermside, Banyo, Bracken Ridge. We cover all suburbs in between. If you’re unsure if we cover you area, please CONTACT US. The House Call Vet takes care of pets all over Brisbane. We don’t charge any travel fees and strive to keep all of our fees in line with those of a regular clinic. You can make an appointment right now using our Online Booking feature. If you’re not sure if we cover your area, get in touch and we’ll let you know! 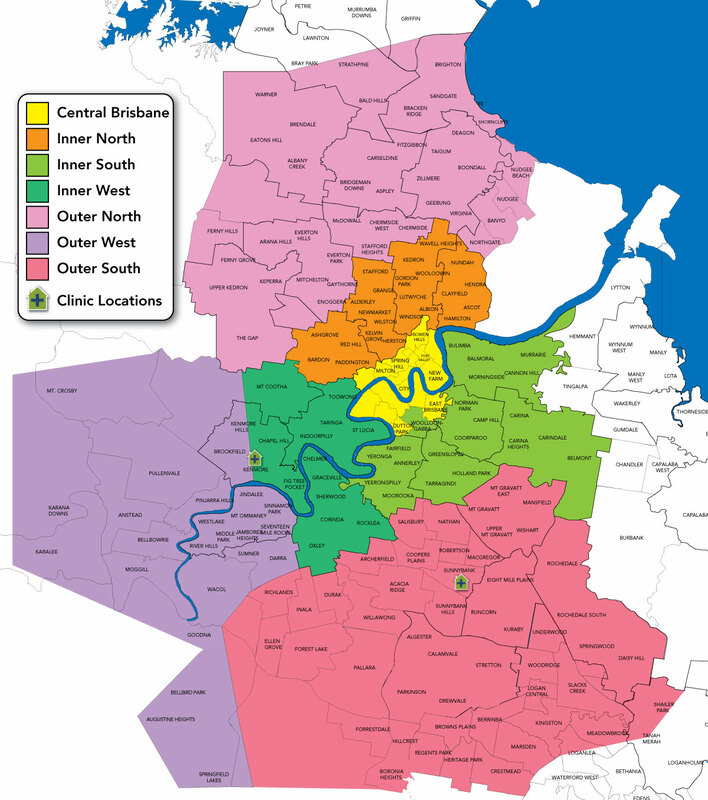 Brisbane, Spring Hill, Milton, New Farm, Bowen Hills, Fortitude Valley, Newstead, East Brisbane, South Brisbane, West End, Kangaroo Point and surrounding suburbs. Toowong, St Lucia, Indooroopilly, Taringa, Chapel Hill, Fig Tree Pocket, Oxley, Kenmore and surrounding suburbs. Paddington, Bardon, Hamilton, Toombul, Lutwyche, Wooloowin, Kedron, Alderley, Newmarket, Kelvin Grove, Red Hill, Ashgrove, Herston and surrounding suburbs. Woolloongabba, Annerley, Yeronga, Moorooka, Holland Park, Tarragindi, Coorparoo, Cannon Hill, Morningside, Bulimba and surrounding suburbs. Brookfield, Pullenvale, Anstead, Moggill, Jindalee, Seventeen Mile Rocks, Augustine Heights, Camira, Springfield Lakes, Karalee, Forest Lake and surrounding suburbs. Nundah, Bracken Ridge, Chermside, Carseldine, Bridgeman Downs, Bald Hills, Everton Park, The Gap, McDowall, Stafford, Keperra, Ferny Grove and surrounding suburbs. Sunnybank Hills, Eight Mile Plains, Calamvale, Browns Plains, Mount Gravatt, Rochedale, Daisy Hill, Springwood and surrounding suburbs.